Dean John Danley speaks at the open house for the new GIS and Biological Sciences laboratories in University Park. The Departments of Biological Sciences and Geography have found room to grow with the recent opening of new facilities in University Park. An open house was held January 9th for the new laboratories and offices in SIUE's Biotechnology Laboratory Incubator facility. The SIU Board of Trustees approved construction of the $1.03 million space last April, which was designed by the Hastings-Chivetta architectural firm. Biological Sciences has gained two new lab spaces, complete with state of the art equipment, visual aids and classroom technology. Additional space for the department includes a lab prep room, offices for teaching assistants and a new lab manager, a student lounge and storage facilities. The new Geographic Information Systems (GIS) space includes a map storage and preparation areas, offices for the new Institute's director and personnel, conference room for client presentations and room for GIS technicians. The Biological Sciences Department is delighted with the new addition. Above, a view of the new Biological Sciences laboratories in University Park. "We are extraordinarily pleased to have been able to move into a new teaching laboratory facility in University Park at SIUE," said Biological Sciences Chair William Retzlaff. 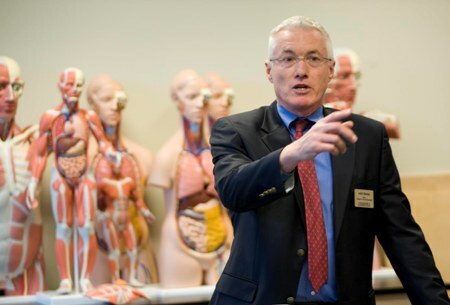 The Biology labs, which are used primarily for teaching anatomy and physiology courses, have helped the department gain a bit more flexibility in scheduling. "Without the new lab space in University Park, the Department would have likely offered Saturday, Sunday, and late evening (after 9 p.m.) labs this semester due to the ever-increasing enrollment pressures," Retzlaff said. 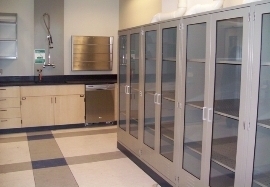 Additionally, Retzlaff said the new space has allowed Biological Sciences to offer more anatomy and physiology course sections this semester, since the original ones had filled to capacity, and expand course opportunities for Biological Sciences majors in the "old" labs in the science building. The new space in University Park has also piqued the interest of many in SIUE's Biology program. "Faculty, staff, and students in the department are also very excited that we are currently 'previewing' what the new space will look like in the new Science Building when it is built," Retzlaff added. Classes in the Biological Sciences labs began Jan. 12. 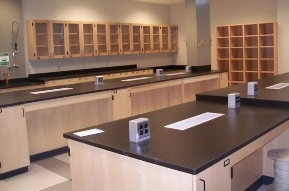 These labs and offices are located next to the Chemistry Department's laboratory facilities that opened up in the Biotechnology Laboratory Incubator facility in August of 2007.